More than 200 University of Southern Maine students unveiled a wide variety of research projects on Friday, April 28 during "Thinking Matters," USM's annual student research symposium. Topics ranged from life in refugee camps and the opioid epidemic to cryptography, hydroelectricity and the use of emoji and other nonverbal forms of communication. The event was held at USM's Abromson Center for Community Education. Student researchers --- both undergrads and graduate students -- introduced their works in spoken or poster presentations during three one-hour-and-15-minute sessions. "Thinking Matters" began 16 years ago as a chance for undergraduates to perform in-depth research and present their findings. 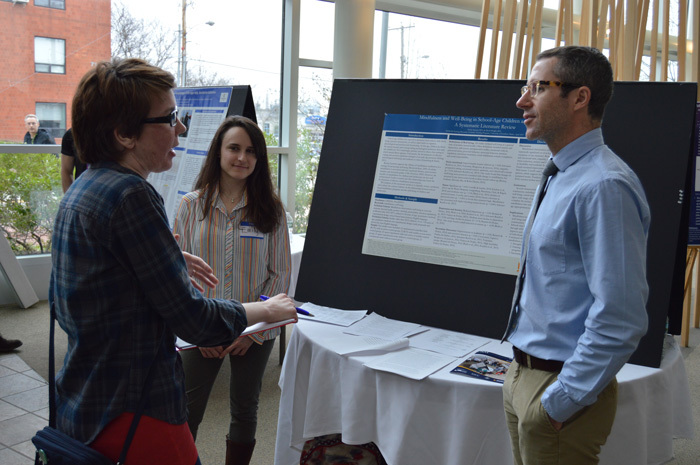 It has grown into an annual student research symposium, promoting high-quality student-faculty research collaborations. The event provides students the opportunity to share their work with both the USM community and the general public. "At the University of Southern Maine, our students have the best of both worlds," said Rebecca Nisetich, the director of USM's Honors Program. "The individual attention of caring professors here rivals that of any elite small liberal arts colleges. And the hands-on, real-world learning opportunities that we have here in the Portland area match --- and even surpass --- those opportunities available at other comprehensive research universities." USM President Glenn Cummings welcomed Southern Maine Community College President Ron Cantor and thanked Kennebec Valley Community College and Central Maine Community College students for their participation in the event.